There is one big hint in the name given to the structures. Osborne is the name of a brandy and sherry company that was established by Thomas Osborne Mann in 1772. Originally from England, he founded his business in Puerto de Santa María, which is a small town near Cádiz. This same company is still in business and produces many of the sherries and wines that you’ll find in bars today. To promote their brandy, the original toros de Osborne were constructed in 1957 and positioned nearby highways throughout Spain. They were originally 4 metres high, built from wood and black with the brand of sherry ‘Veterano’ written in red. In 1961 they increased the size of them to 7 metres and also started to produce them from more durable sheet metal. The following year, legislation was passed that meant all billboards had to be further away from the road. This encouraged the Osborne sherry company to increase their size again to 14 metres and enable them to be positioned on top of hills silhouetted by the sky. 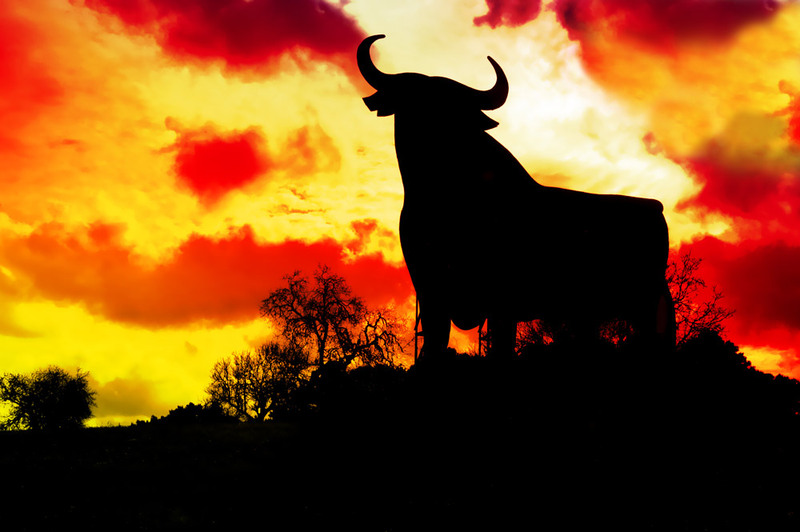 Little encapsulates Spain other than this shape of the bull. This design efficiently combines many aspects of Spanish culture – bullfighting and the history and pageantry associated with this controversial sport but it also provides links to Spain’s rural and farming industries. This simple design; set against the backdrop of an Iberian landscape, has made it hard to imagine anything more typically ‘Spanish’. The shape of the proudly standing bull also conveys the notions of virility, power and masculinity and this symbolism has also been exploited by filmmakers. In the movie Jamón, Jamón, there is recurring shot of two young lovers… err… ‘spending quality time’ together underneath one of the Osborne bulls. And if you go to any souvenir shop, you will see the black cut-out of the bull on t-shirts, flags and postcards. It’s easy to see that this shape has transcended advertising and has become the unofficial symbol of Spain. In July 1994 a new General Highways Act was passed that limited advertising on highways. As a result; all of the Osborne bulls had to be removed to adhere to this legislation.However after lots of media attention and support from powerful individuals, autonomous governments and the Department of Culture, the Osborne bulls were allowed to stay but on the condition they were completely black and that all advertising be removed. They agreed that the simple black figures had become part of the landscape and had invaluable “cultural significance” for Spain. 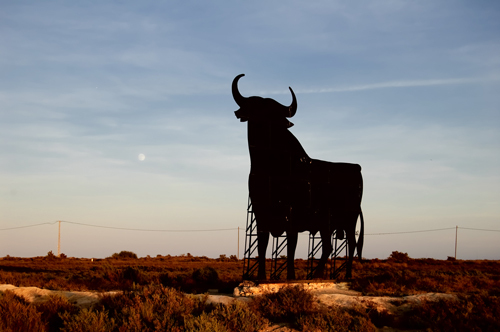 Some say these bulls watch over the roads of Spain and there is obvious irony in old billboards that advertised alcohol, ‘watching over’ the highways of Spain! This combined with how something so culturally valuable that started with an English foreigner, was almost lost, is just one of those quirks of fate we can all marvel at.